San Bernardino County sheriff's deputies beat a man at the end of a pursuit in the high desert on Thursday, April 9, 2015. An NBC News helicopter captured video of deputies kicking and punching a man on Thursday while taking him into custody after a three-hour pursuit in the high desert of Southern California. 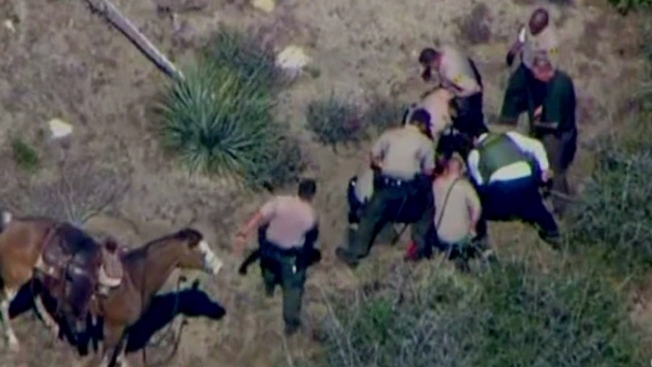 On the video, San Bernardino County Sheriff's deputies can be seen using a Taser to stun Francis Pusok when he fell off the horse and kicked and punched him after it appears he was trying to surrender lying on the ground with his hands behind his back. Below is a timeline of events that prompted 10 deputies to be put on paid leave while the San Bernardino County Sheriff conducts an internal investigation and the FBI opens a federal civil rights inquiry. Francis Pusok, 30, was being held in jail, booked on a handful of charges, a day after he was beaten by deputies after a chase on horseback. Patrick Healy reports for the NBC4 News at 5 p.m. on Friday, April 10, 2015. Friday, April 10, 2015: Pusok faces charges including, theft of a horse, and possession of stolen property, said Sheriff John McMahon. Francis Jared Pusok, 30, of Apple Valley, said "I thought I was being beaten to death" when he was assaulted by San Bernardino County Sheriff's deputies Thursday in an incident caught on video. Gadi Schwartz sits down with him for NBC4 News on April 13, 2015. Monday, April 13: Pusok’s scheduled arraignment is postponed to June 16.